Jihadist groups like ISIS or al-Qaeda have integrated this media imperative by closely linking propaganda and leadership, thus embedding the media branch in the heart of the operational apparatus. The martial lexical field shows it: media propaganda is a war front per se. Beyond the sole aspect of ideological propaganda, leveraging it in an operational purpose is at stake, at each stage of a potential terror attack supply chain (recruiting, fundraising, circulating lists of targets, providing tutorials, remote-controlled operations, making claims, and even live broadcasting an attack with go-pro cameras). As the military setbacks have accumulated in Iraq and Syria, the virtual front has taken on vital significance, as the locus of virtual expression of the Caliphate’s ideology, that has to remain vivid until its concrete resurgence, and as an operational and logistic tool. The group has mastered not only the virtual world but has done so in multiple languages to reach the largest audience and ISIS channels proliferate in over 25 different languages increasing every day. One of ISIS’ main characteristics is found in its structure, the production scale and the modus operandi of its media enterprise, in particular its tactics to systematically leverage social networks and the various accessible webtools, harnessing their momentum since the end of the 2000s. Emerging from obscure web forums (mostly in Arabic and difficult to access) towards the surface web contributed to a popularized and “available” jihad. This momentum was somewhat curbed at the end of 2015 when numerous accounts and user profiles (in particular on Twitter) were suppressed in the wake of the Paris attacks and the first victims families’ lawsuits in the fight against terrorist propaganda. ISIS subsequently migrated towards Telegram, an encrypted messaging application, choosing operational security and longevity over its communication reach and visibility. ISIS’ migration to apps like Telegram was a ‘tactical retreat’ of sorts to partially operate underground in the deep web. Indeed, during the early months of ISIS on Telegram, channels and groups were mostly accessible via public channels found by searching relevant keywords (such as #KhilafahNews) but many of their channels have quickly evolved into key-only access (a link key available for a very short period of time that gains access to a particular channel). Telegram thus remains a relatively safe haven for ISIS: channel and group deletions occur less frequently than in mainstream social media and the unidirectional format of the channels (where only designated moderators can post) doesn’t give room to counter propaganda. Last but not least, content (documents, videos, pictures, audios, etc) can be directly uploaded inside the application, without links towards other websites, without limit of size, giving the content greater shelf life and a far lesser rate of deletion than in mainstream social media such as YouTube, Facebook and Twitter. The surfacing and dissemination of jihadist messages on the public web serves two purposes. 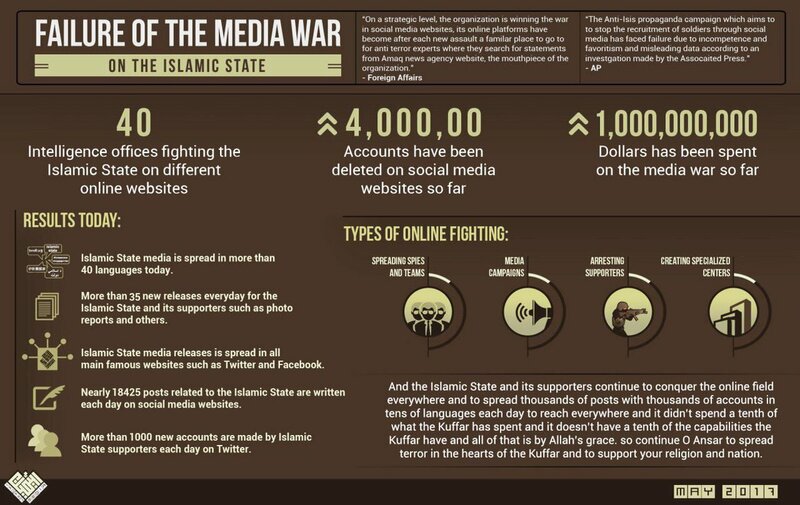 Apart from the retention of a steady virtual presence from which ISIS can connect with its loyal fanbase (which allows ISIS to boast about online CT failure, see screengrab 2), the aim is also to infuse the message into social networks. The recruitment reach is expanded to a larger public audience than Telegram users: more accessible on Twitter, Facebook and Google+ to potential recruits, these accounts may be providing an (first) interaction with jihadis or contact with propaganda. Ideally, the subject is then funneled to Telegram where the exposure to this propaganda turns out to be more intense. 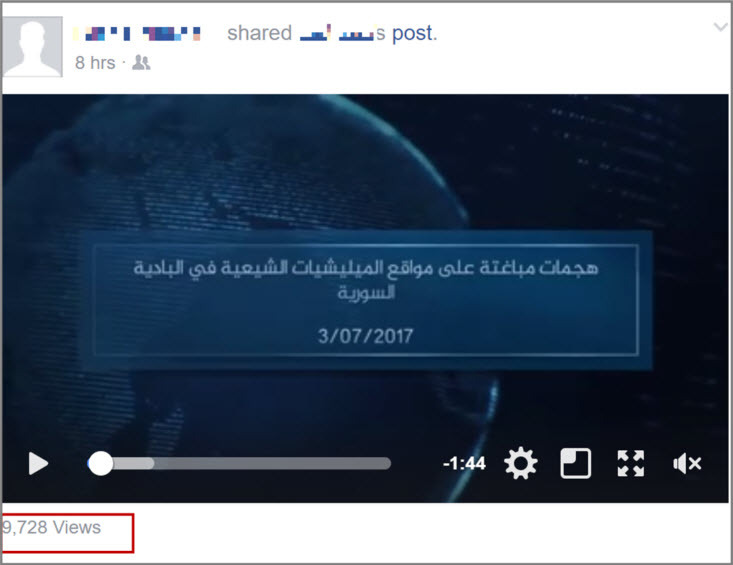 The launch of an official publication by one of ISIS’ media outlets systematically comes with a barrage of links pointing towards files on cloud servers or storage websites, disseminating as much as possible and even renewing them once the first salvo of links are censored and removed by the interested parties. This process is repeated frequently over the upcoming months. Spreading risk of censorship and overwhelming cyber intelligence teams are two of the pursued objectives here. These links are immediately shared on social networks and become available to groups, followers, friends or publicly with hashtag searches, reaching an important recruitment pool by capillarity (screengrabs 3 and 4). 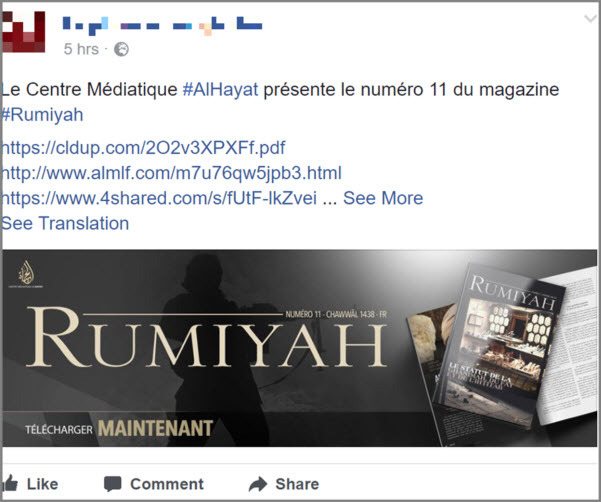 Screengrab 3: sharing of links to download Rumiyah magazine on Facebook (July 2017). Screengrab 4: Content (video) uploaded on Facebook (July 2017). The use of hashtags, popular across social media can be viewed as batons in a relay race passed between platforms or within multiple consecutive accounts on a single platform. 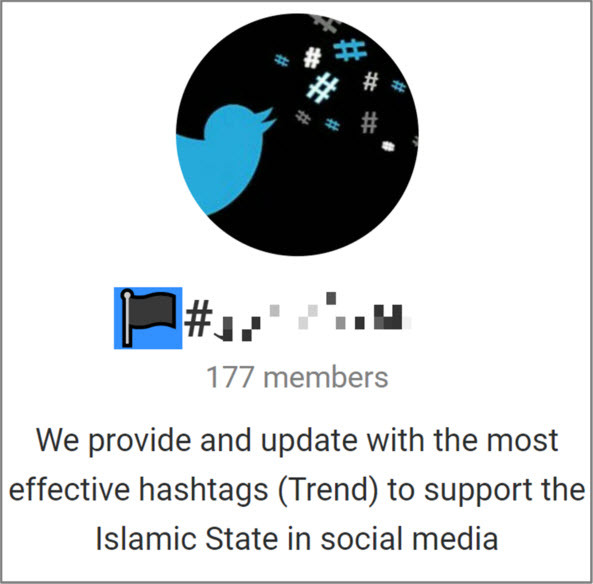 They can be correlated with ISIS, but recommendations of unrelated and trending hashtags are being regularly circulated by ISIS-linked accounts or channels, to disseminate to a wider audience (screengrab 5). These links appear systematically with each official ISIS publication, whether video, audio or a new magazine. Techniques of lingering or reappearing on cloud server or storage sites are numerous. On occasion images or text can be altered to bypass detection by algorithms of digital fingerprints (screengrab 6). Screengrab 5: ISIS-linked Telegram channel providing most trending hashtags per country on a daily basis to disseminate propaganda (July 2017). Screengrab 6: Example of a possible picture alteration to bypass detection by algorithms of digital fingerprints – Teaser image of ISIS’ spokesman audio release (12 June 2017). Links to new Twitter accounts, or “resurgent accounts” for old ones after deletion, are frequently promoted via Telegram. 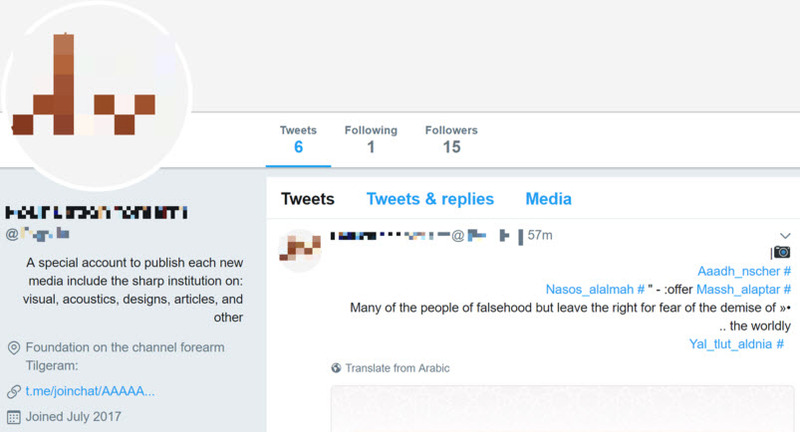 These new accounts with sometimes innocuous or randomly generated profiles or usernames succeed (despite a limited time frame) to circulate current ISIS content and on occasion to list a new “exclusive” Telegram channel in the bio, at times a key that doesn’t not appear elsewhere (screengrab 7). Turnkey tweets may be provided by Telegram so that sympathizers just have to copy-paste them on Twitter. Screengrab 7: ISIS-linked Twitter account providing a link key to a Telegram channel (July 2017). Screengrab 8: Announcement of the return of a previously suspended account on Twitter via Telegram (June 2017): “Once again suspended, once again back — Hello Twitter”. It should be noted that their penetration into social networks goes beyond the aforementioned platforms. ISIS regularly sets up shop with Instagram, Snapchat, and emerging new apps. 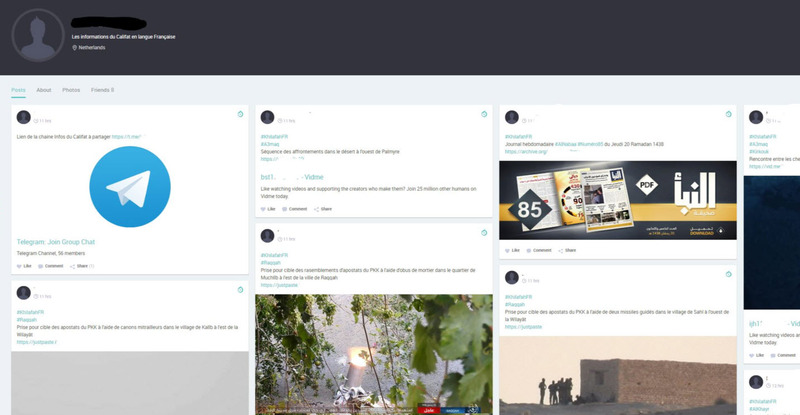 Recently, the new social media startup Baaz endured significant infiltration by ISIS sympathizers who stepped into the control breaches of a small and still inexperienced team, by creating public accounts and groups en masse (screengrab 9). Screengrab 9: Group of ISIS sympathizers created on Baaz (June 2017). Screengrab 10: Announcement that a relay link to Telegram channel will be provided via Google+ (July 2017): “in case of censorship of our Telegram channel, new links will be posted [on our Google+ group] incha Allah”. Screengrab 11: Example of the short life expectancy of a key link on Telegram to limit infiltration (June 2017). If global action is not undertaken in the near future, we are at risk of witnessing – in addition to the survival and expansion of the jihadist message – a surge in the use of content aimed at operational use. This is evidenced by the recent cases of Khalid Masood (Westminster attack – 6 dead, 44 wounded) and of Salman Abedi (Manchester Arena – 22 dead, 116 wounded), both of whom had previously watched or downloaded manuals or tutorials via social media. This article was originally published in French language on Ultima Ratio on 25 July, 2017 and in English language on Bellingcat.com on 1 September, 2017. Republished here with permission from the author.